Anirban Das is making his book debut with Just Kidding Yours, Destiny. The implied essence of the story is about making choices, their consequences and the role of destiny. The plot is a simple story, revolving around the complicated life of Kunal Roy. Ambitious Kunal is living the great Indian dream, having purchased a house in Mumbai, driving an expensive car and striving to earn pots of money. Having slogged for donkey’s years in the same company, Kunal believes that he is a star employee in his company. He is determined to reach the top with a simple mantra - hard work and dedication. Kunals seemingly planned life and ambitions turn awry with the sudden acquisition of his company and an abrasive new boss who puts Kunal to the sword. Kunals life is further turned upside down with the entry of a company rookie, Shristi, compelling him to change his world view and his lifes priorities. Is Shristi for real or is she an illusion? And who is the real Kunal? Undergoing upheavals in both professional and personal life, Kunal looks to jettison his ambitions by embarking on a journey of self-discovery in an attempt to regain his lost identity and a semblance of control. This book aspires to strike a chord with the readers, engage and entertain them. It has been written from the heart, in a manner, which is characteristic of the authors writing style. The story has been set in a typical Indian urban backdrop but the emotions enunciated, would transcend country barriers. Ignoring his childhood aspiration of becoming a sportsman, Anirban Das obtained a degree in mechanical engineering from Walchand College in Sangli and followed it up with a post-graduation in Advertising from NMIMS, Mumbai. He worked with an Indian automobile conglomerate in a variety of roles, before quitting his job to pursue his MBA from IIM, Ahmedabad. Kunal is a hardworking and an ambitious man. Life teaches him lessons in its own way and Kunal changes from a carefree college-boy to a serious senior employee. His transformation from the serious late 30’s man to that of a carefree man is captured nicely! Shrishti hails from a rich family; a beauty with brains. She is young and cheerful. At the same time she is practical. She is emotional, of course, but she also controls them for the greater good. She is selfish and at the same time very friendly. In short, complicated! Then there is Sarika, Kunal’s Ex-wife…Harry, Kunal’s Boss and Jasmine, Kunal’s friend! The cover-page is vibrant and attractive. It will surely catch the attention of readers. Having said that, I liked the book’s title per se. It is catchy! The book is a short and sweet one with less than 200 pages. It is well edited and the story flows with ease. Except the second chapter where there were too many technical details. The chapters carry thoughtfully laid out titles and most of the chapters carries thought provoking quotes too. The characters are real and the situations are no different. The book depicts the life of a common man with many pitfalls and where most of the dreams don’t come true. The story is about what we want/expect/need as against what really happen. As the title rightly describes, it is about desires/dreams VS destiny! What I loved the most about the book is that it is not yet another happy-go-lucky and happily-ever-after types. But, I would not call it as a cynic’s or pessimist take on life. Instead, I would say, it is a rather real take on life sans any make-up or decorations! The footnotes – They are so irritating. It hinders the flow and makes the reading tough! As I said, it’s a small book with a little less than 200 pages. You can complete in one go. And it is a complete timepass. I completed in a single sitting on weekend. Having said that, this book might not be a feel-good one. But it will not fail to impress you! 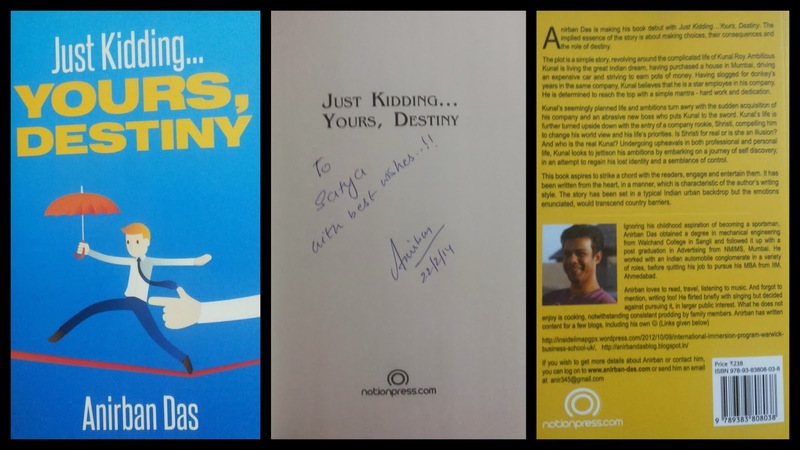 Anirban Das, the author for contacting me and sending me a personally signed copy. Congrats for the book and all the best for more to come! © When you give someone the power to make you laugh, cry, sad, angry, you can say with certainty that you are in love. Of course, this holds true for you only, not necessarily your counterpart. © Whatever happens in life, happens for a reason. But not everything in life that happens, happens for the best. We just choose to brainwash ourselves, thinking it is so. © Life’s journey is am outcome of the choices made, and there is always a choice. A decision not taken is also a decision. And the role of luck should never be underestimated.